Imagine the possibilities of sending video over Wi-Fi to any TV in your house? That’s exactly what the StarTech HDMI wireless display adapter with Miracast does. Last week, I wrote about how today’s high-tech consumer electronics products are similar to devices in sci-fi movies. Here’s one more piece of futuristic technology that’s available today. It’s made by StarTech, which in name alone is enough to conjure up a sci-fi fan’s deepest technology fantasies. The product itself is a display adapter with Miracast. That certainly sounds high-tech, and it is, but I’ll be happy to put it in layman’s terms. This device takes what’s on your Android phone or Windows 10 computer and displays it on a TV monitor. While it’s not quite the Enterprise’s “holodeck,” it’s pretty darn close! So what’s the benefit of displaying your cellphone or tablet’s contents to a TV screen? Well, that’s for you to decide. For example, you could easily show the vacation or baby photos on your phone to a house filled with relatives. There would be no downloading and messing with photo files involved. And if those shots already are on your computer, you can avoid having everyone fight for space around your computer monitor simply by showing the photos on your living room TV. Imagine their oohs and aahs as they marvel over the newest family member or photos of Paris at sunset. Do you like playing Solitaire, Angry Birds, or any other game? Put it on your TV if you really want to have some fun. This could be especially entertaining for Pokemon Go players. Picture this – you settle into your favorite chair, drops some bait or don some incense, then wait for the myriad and strange Pokemon creatures to show themselves. Watching these Poke-battles on TV surely takes the game to the next level! As I said, the ways for using this device are only limited by your imagination. 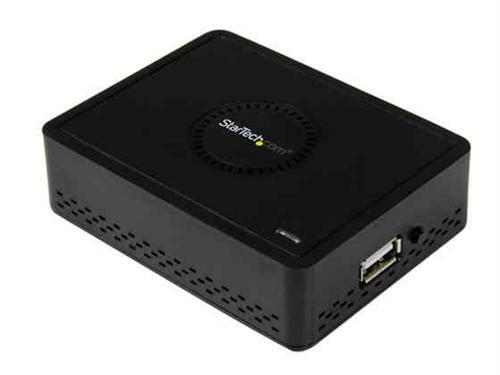 As to the particulars, StarTech’s wireless display adapter can be used with almost any Windows 10 PC, laptop, or tablet, as well as Miracast™ enabled smartphones and tablets. It’s supported across many wireless devices and operates without any software or drivers. For guaranteed compatibility with any Windows computer, the product includes easy-to-use software for wireless output of video from your laptop or Ultrabook™ to an HDMI display. It also features a built-in USB port that lets you to see media files from your USB drive. With innovative products such as the StarTech HDMI wireless display adapter with Miracast, the world of tomorrow is here today. Solid Signal is happy to be at the forefront of all this innovation. When it comes to consumer electronics products, we have it all. And our team understands these useful gadgets inside and out. If you’d like to know about our products and how they can enhance your life, just call us at 877.312.4547. NOT THAT YOU WOULD BUT: Could you hook up a cell booster in a plane and get service? FROM THE RUMOR MILL: Can you turn a C41 wireless?